This recipe is all about the sauce and fresh fish. To make great food you need the best ingredients and you need to extract as much flavor out of those ingredients as possible. This is the case in the sauce. You might be scared to fillet a fish at home and maybe you fishmonger will fillet it for you but don't throw those bones away. You throwing away flavor! Use the bones to make a delicious sauce for your fresh gulf red snapper. 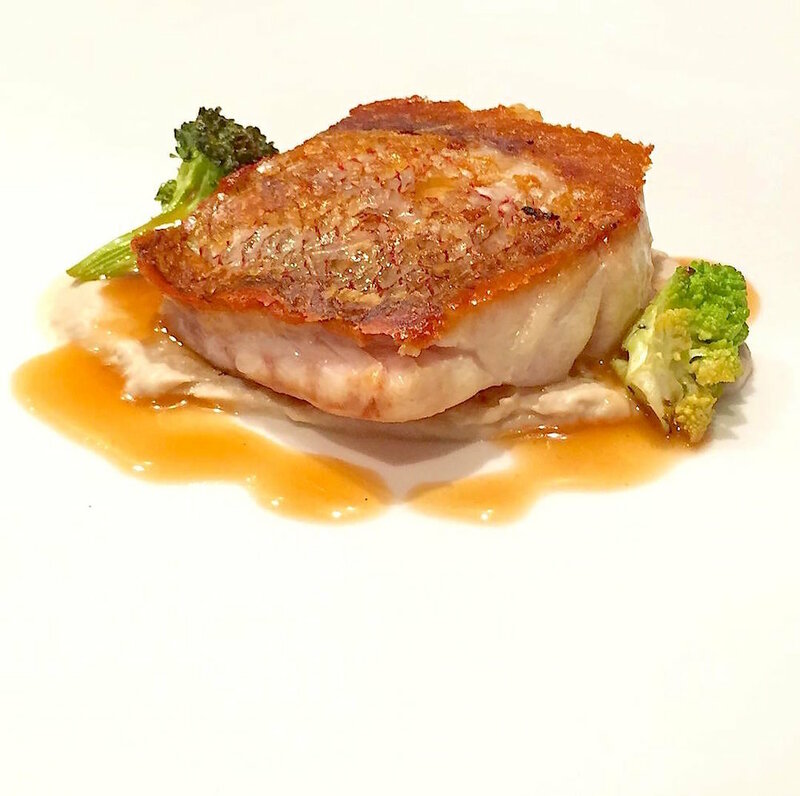 I combined this snapper recipe with sunflower seeds and brassicas. Here is the recipe I hope you enjoy it! In a large saute pan add 3 tbsp of olive oil. Take your snapper and season generously with salt on both sides of the fish. Then place the fish skin side down into the pan (not you can score the skin with a knife if you so choose, I did not) The fish will want to curl up, so take your fingers or spatula, carefully not burning them, and push down on the fish for about 10 seconds. This will help "set" the skin of fish flat in the pan so a nice even crispy skin can be achieved. Cook for 4-5 minutes on the skin side. Meanwhile heat up romanesco and broccoli in a small saute pan with a little butter and olive oil. Season with salt and cook for 5 minutes until tender. Place a spoonful of sunflower seed puree on the plate. Take out the snapper and place the snapper on top. Add the brassicas to the plate and finish with the sauce around the snapper. Serve and enjoy!